(This blog was originally posted at Next Billion). One of the harsh realities of the current state of global health is that the quality and supply of life-saving innovations exceeds the capacity of many health systems to deliver them. Exciting new innovations are being developed. But for many low-income countries, gaps in the underlying infrastructure to support their delivery – especially for rural areas – limit the potential of these innovations to improve health care. In our experience at VillageReach, looking at the problem from the point where health care is delivered to patients ensures that capacity development focuses on the weakest link – the last mile – but also where underlying infrastructure is most limited. We’ve determined that private enterprise has a significant role to play in developing the infrastructure necessary to achieve sustainable improvements in health care. Vaccine development – arguably global health’s greatest innovation – is a case in point. With billions invested, the aggressive introduction of vaccines has saved millions of lives. But subsequent gains have been more elusive: Many low-income countries have seen immunization rates essentially stuck at 80 percent. GAVI Alliance CEO Seth Berkley estimates that today as many as 22 million children are unable to access vaccines. More than two million die from vaccine-preventable diseases every year. Efforts to reach the remaining 20 percent – the Final 20 – have been insufficient, largely because much of this neglected population is rural and remote. For many of these communities, long travel distances, minimal transportation services and high poverty rates prevent mothers from making their kids available for immunization and other basic health care measures, raising the cost of health services. Families with sick children find it more difficult to exit poverty, and their communities have fewer opportunities to advance. With so much investment and innovation in vaccine development, we should be looking to where leverage can be applied to fulfill that promised value. 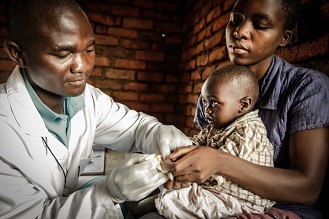 Much of VillageReach’s work has focused on improving vaccine delivery by increasing frontline health worker productivity and capacity, and making information technology more useful and practical in the field in order to improve data reporting and performance measurement. Our model also leverages private enterprise to develop common infrastructure that both health systems and the communities require. In creating opportunities for investment in infrastructure, we look at gaps in key community services – transport, communications and energy supply, for example – that limit health care delivery. The intent is to address the health access and capacity problem by creating enterprises that also serve commercial customers in order to achieve financial sustainability. This focus on infrastructure isn’t only to provide single solutions for common problems. The economic multiplier is higher for investments in infrastructure than in other sectors, since the construction of roads, bridges, communications, and energy supply networks employ workers and enable commerce. World Bank President Jim Yong Kim acknowledged the importance of this link recently, noting that investment in Africa’s infrastructure increased from 16 percent to 22 percent of GDP over the past decade. Africa’s 5 percent annual GDP growth during the period is greater than for any other region worldwide. Mozambique and its health system have faced many of the same challenges of other countries in sub-Saharan Africa. Much of the population lives in remote communities that are difficult to reach. Less than 35 percent of the country has access to the electrical grid – access is much lower for rural communities. Health services are also impacted: The supply of vaccines to rural health centers is irregular due to the great travel distances involved, and limited refrigeration results in wasted vaccine stock. This lack of reliable energy also impacts health center performance well beyond vaccine delivery, making it difficult to sterilize medical equipment and provide the necessary lighting for procedures conducted after dark. We set a goal of improving the capacity and reducing the cost of health care delivery in Mozambique. It was clear that a solution was required that would address the critical gap in energy supply affecting the performance and economics of the cold chain for the health system. It was also clear that the solution must be sustainable by attracting broader demand for the service. In 2002, we established an energy services company, VidaGas, in partnership with Fundação para o Desenvolvimento da Comunidade (Foundation for Community Development). When VidaGas was created, the initial network of rural health centers comprised 100 percent of gas shipments. Today, that percentage is 17 percent. The majority of VidaGas’ service is now directed at enterprise customers – restaurants, hotels, small factories, and a growing retail network that enables households to replace traditional wood and charcoal that produce harmful indoor pollutants. The message is that without revenues from the private sector, the company wouldn’t have the resources to support its obligations to the health system. The company’s growth – in excess of 35 percent annually since 2010 – has accelerated with additional capital investment from Bamboo Finance/Oasis Fund. Today, VidaGas is expanding its operations into new geographies and market segments. The company is now the largest independent energy services provider in northern Mozambique, with three large-tonnage storage and filling facilities across the region serving five provinces and more than 50 percent of the country’s rural health centers. We anticipate similar growth in the future, as the business expands its base of enterprise customers, builds a larger retail network to reach more households, and expands operations into new provinces in order to supply more rural health centers. As a recent MBA graduate, I joined VillageReach for the summer tasked with evaluating our models and frameworks to further reach scalability and create sustainable business opportunities.Throughout business school, I was taught the importance of proving that financial profitability and measurable metrics are essential for making business decisions. Shouldn’t this common standard be used to measure socially-focused investing as well?Our philosophy at VillageReach is that there is a place for social investing in which we can create profitable businesses that have the potential to achieve both a financial and social return. We have proven a case in which the combination of non-profit dollars and entrepreneurism can build a sustainable business. Whileventure capitalists seek to create financial returns by investing in new technologies, VillageReach aims to improve established energy and logistics platforms to build base-of-the-pyramid businesses. However, unlike the VC world, there is no standard metric to calculate and measure the value of a social enterprise.Instead, the development community of entrepreneurs, philanthropists, and foundations has the challenge to develop a standard methodology. We’re excited to see the momentum and collective steps that organizations and individuals are collectively taking, especially as the Acumen Fund declared yesterday the WMD (World Metrics Day)! At VillageReach, we are evaluating different methodologies to formulate our approach to quantify and present the value of a social investment. We are considering two methods: a BACO Calculation (for best available charitable option – created by the Acumen Fund) and an SROI calculation. The BACO model enables us to perform a cost-effective analysis on philanthropic dollars by comparing two options: a charity donation vs. an investment in a business. This analysis provides us with decision-making data to assess and determine the return the greatest social impact at lowest cost. The SROI (“social return on investment”) methodology has been in development for many years, and calculated using a discounted cash flow analysis + projected socio-economic contributions (direct, demonstrable cost savings and revenue contribution that are associated with the social purpose enterprise) into a projected blended business performance. There are distinct challenges with both of these approaches as it is difficult to often find a “comparable” charity donation and quantify the context of social outcomes. However, we strive to build quantifiable metrics that will help continuously evaluate our investments and allow us to communicate our impact to an external audience. Let us know what steps you are taking or thoughts about this process as this is clearly a shared effort. Why is a Social Enterprise required in the VillageReach Model? We all know that operation of any health center requires a variety of external inputs- energy, transport/logistics (delivery services), and communications systems to name a few. In wealthy countries, these services would normally be provided by the commercial sector. In focusing efforts on the “last mile,” however, any and all of these commercial services are simply not available or are so expensive to procure that they are not operationally viable. At VillageReach we focus on energy, transport/logistics and communications, the “Enabling Services” that are required to fulfill the mission of VillageReach programs. When implementing health care programs in regions with weak or nonexistent Enabling Services, NGO’s have traditionally elected to handle the provisioning of Enabling Services internally. Trucking in generators, fuel and other supplies directly supports the program objectives but it does little to provide Enabling Services to the surrounding community. It is widely recognized that a successful and sustainable program intervention creates and uses local capacity. The VillageReach model and programs to date have as a guiding principle the creation of local capacity not only for last mile health care infrastructure but also for the Enabling Services that support that infrastructure. To sustain the improvement in health and decrease in mortality that is the core of the VillageReach mission it is necessary to create permanent health care resources in last mile communities. Sustainability requires that Enabling Services be available, be reliable and can be procured at affordable rates for the long term. In order for Enabling Services to be available for the long term the customer base must be substantially larger than just the rural health care clinic and therefore must include a vibrant market in the local community. The lack of Enabling Services in many of these rural situations clearly shows that sufficient market demand does not exist today for a viable commercial business. It’s a classic chicken and egg problem – VillageReach is moving forward as a catalyst with creating basic demand for Enabling Services as part of its programs to support last mile health care and incubating the required commercial business for the services. So, why is social enterprise required in the VillageReach model? Because without established Enabling Services as one of the key elements in the intervention – the VillageReach programs would not achieve the required sustainability and would become yet another solution that fails to provide the long term impact when transitioned to local operation.